It was SO Exciting! Finally, we were on our way. A year of planning, running, running, running…. 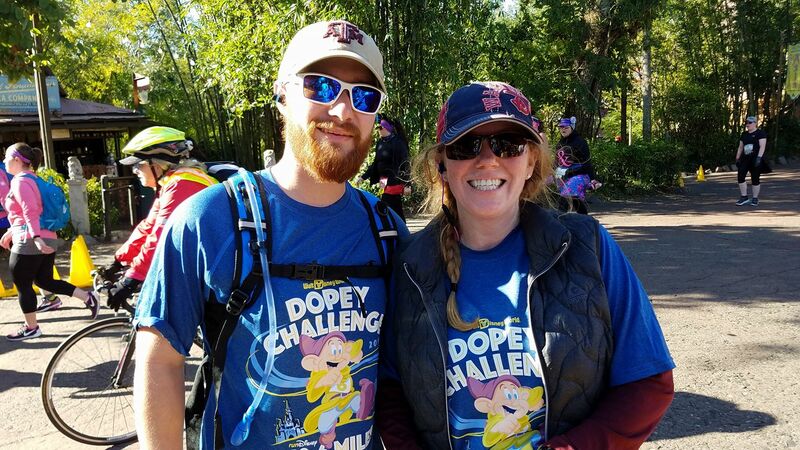 ups and downs, illnesses and setbacks and here we were – for better or worse heading to Disney for the Dopey Challenge. It was hard to believe we were on our way. There were times this year I wondered if we’d make it. We were meeting some great friends for this trip also and we were all excited to get together. We arrive and rainy. As we check in the agent at the counter discovers we are running the Dopey Challenge. She promptly pulls this out and hands it to me. OMG I thought that was so funny and so relevant! Totally possible that I may need this after the marathon I pocketed it with the rest of our stuff. Took a pic of the board – 3:30 buses! Holy moly that is going to be an early 2:30 alarm. We have dinner planned in Disney Springs at Paddlefish which used to be Fulton’s crab house. Kam and I were married at the Chapel by the Grand Floridian and had our reception at Fulton’s in 2005 so I thought it would be a great way to kick off our trip. Of course, we to stop at the Magic of Disney for some shopping prior to dinner. Taylor found a cute ewok hat – given the projected weather for the weekend – it was definitely worth considering! It was colder than usual for Florida – even in January. Wednesday morning we decided to go to the park early before the expo opened at 12:00. We met up with all our friends traveling with us and headed to the parks! It was so cold and wet! There was a high of 55 and a low of 36 and it was windy and rainy. No one was in the parks which was great for us. 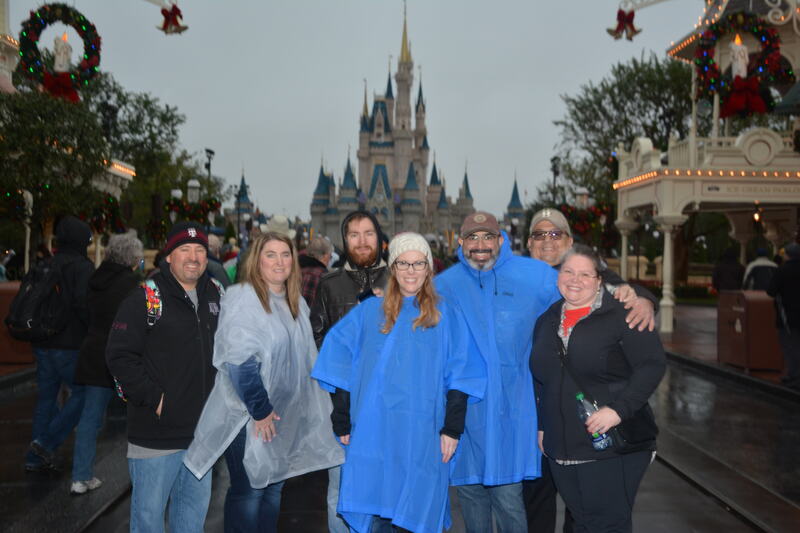 Yes we were cold and wet, but we were in Disney. We headed to the Expo after a lunch at Jungle Navigation Company. I had expected lines – but I wasn’t prepared for what we found when we got to the Expo. I had done two previous race weekends, Wine and Dine November 2014 (also referred to as the splash and dash from those who ran) and Avengers Weekend November 2015. Those Expos made sense – you got your bib, you headed into the expo. What I learned from this race weekend is; 1 – sign up for VIP access. Not only did runners sign up for VIP access which allowed you to enter early but so did many shoppers looking to sell merchandise for twice the amount on eBay. 2. Get your merchandise and then get your bibs. Your bibs aren’t going anywhere but that merchandise is selling out especially in smaller sizes. 3. If you really want a collectible, Dooney bag or something slightly exclusive – order it in advance. over to the vendor part and got himself a beer then joined me. Great for us – we were in line with a bunch of Aggie’s and had a great time talking with them as we waited. When we got in we were shocked to find how much of the Dopey merchandise was sold out. I think I grabbed one of the last magnets, no smalls or mediums were on the hangers and all the Dooney crossbody’s were sold out. We realized there were a few still on the tables where people had tried things on and decided against them – I found a large (too big but manageable sweatshirt and Taylor lucked out with a medium sweatshirt. We also got our magnets, a couple of tumblers, a generic RunDisney Sweatshirt and two tech t-shirts for Dopey. I decided on the men’s version because I couldn’t get even close on the women’s sizes not to mention I liked the blue of the men’s version better. It took us forever to get through the expo. I expected us to be able to head back to the park and ride a few rides before dinner. 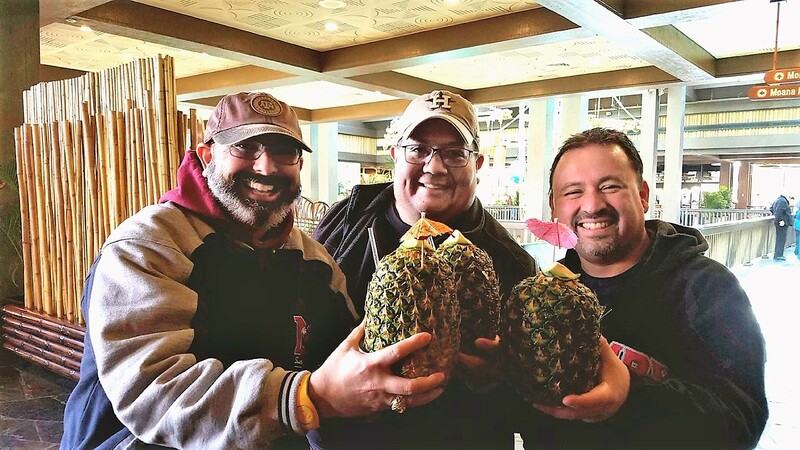 Not even close – we had to take our whole Expo haul and head to Epcot to meet everyone at the San Angel Inn for dinner. What an ordeal. Given our early wake-up call – 3 am as for the 5k and 10k we had to be on the busses before 4 – we headed to bed after our dinner. The gang hung back and enjoyed Epcot some more. We got all our costumes laid out and headed to bed. Day 1 – 20248 steps – No race – expo and parks only. Holy moly it was COLD!!!! Getting up was ok – we were excited. After checking the weather we realized we needed to add to our layers. They have you get there so early – you are standing around for a while before your turn to run. Given we were also in the last corral for all our races – that just extends the time we wait in the cold conditions. I had come prepared for the cold. I had brought thermaband heated back warmers, tons of hand warmers and had made sure Taylor had warm running tights as a base layer and a hat and gloves. He didn’t think he’d need it but man was he glad that he had it! I had on running tights, leg warmers, cold gear running pants, two tops, my sweatshirt, my costume and then my running vest. I had a hat scarf and gloves also along with all my secret heaters. We also brought mylar thermal blankets for before the start. You can’t take it with you as you cross the start line as it interfere’s with the chip trackers. It was about 33 degrees and with the wind, it said feels like 25! We huddled up and found that they had a couple of warming tents for us. Literally, we didn’t have near as much socializing as we usually had before one of these races because it was so cold. Making the best of it we hung out until they told everyone to get to their corrals. There were no sweepers (timekeepers that ensure you are under a 16mm) for the 5k so the mood was light – everyone was excited to get moving! It felt very much like the opening ceremonies of the Olympics. We had all made it, it was starting and our stroll through Epcot was just that – people saying hi to friends, checking out each other’s costumes, taking pictures and having a great time! Approaching the finish line – Taylor turned around gave me a push back and took off. You can see the look in pic two – of how he got me. I finished up just after him as he was laughing at leaving me in the dust. That’s what I get for having my kid be my running partner. 5k Behind us – we headed back to our hotel for breakfast #2 – everyone was just about sitting down when we arrived. We ate, took a shower and nap and then headed to meet everyone for Lunch and some park time. We spent the afternoon at Hollywood studios after having a great lunch at Mama Melrose and finished with an amazing dinner at Brown Derby. I have a lot of food allergies so they always make something off menu for me and the chef served me a wonderful meal – the best I had the whole trip. After dinner Taylor, Kam and I headed back as we had the 10K tomorrow! We laid out our clothes and other layers, heaters etc and headed to bed. 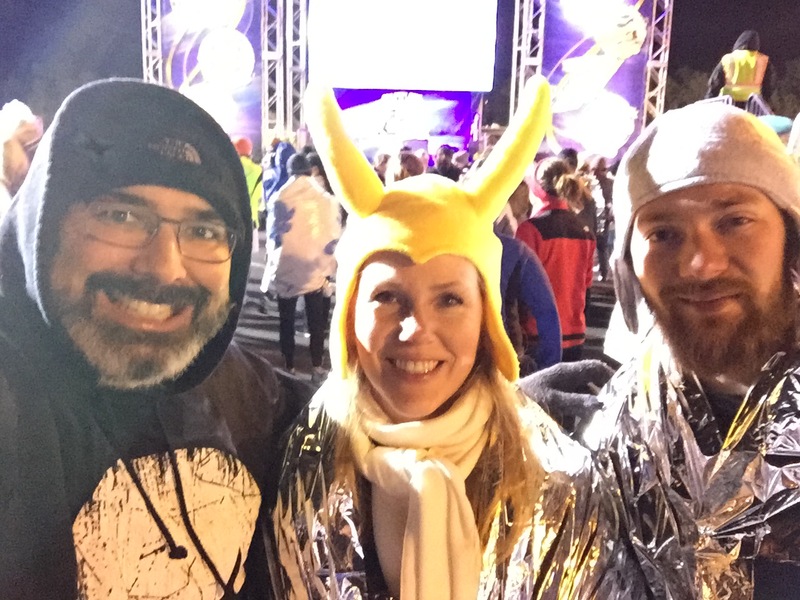 26,016 steps – 5k and Hollywood studios. We were up and ready just like yesterday. Still feeling pretty good getting ready to go knowing the cold we were facing and what we needed to do. Kam was with us on this race and he hadn’t really trained for it. We knew we’d be going more at his pace today but we were trying to save our legs for the half and full and were fine with going slow. We were excited to be representing some of our favorite Marvel characters today – even though it was mostly hats and sweatshirts. It was so cold – our costumes would have been covered by coats and layers anyways. We posted this pic which was reshared by Team Run Disney before the runners’What an honor to be picked out from all the runners’ pics. Actually colder than the day before we found our tent and huddled together. We were in our corral before we knew it and after winding around to the finish line were surprised that the balloon ladies were right behind us. Somehow with everyone’s shuffling, we ended up in back. Kam was super nervous but I knew he would be fine. We got off to a good start – happy to warm up and run and put some distance between us and the balloon ladies. Little did I know that several times throughout the race – Taylor told Kam the balloon ladies were right behind him. Talk about adding some motivation. They weren’t of course – we were doing fine – I mean – we could see them off in the distance but we were in no risk of being swept. As we passed one of the DJ’s they noticed Taylor in the crowd and shouted – Hey Thor! Hey Thor! Dude, you’re a beast! Look at his beard! That dudes a beast! It was hilarious. We finished up – unswept and hungry! Time to celebrate! Have some breakfast, a shower, nap and head to the parks! Kam had gone into the parks before us not feeling as tired as we were and we met up with everyone at the Polynesian for some lunch at Kona. Needless to say – everyone had at least one drink prior to our arrival and the party was well underway. We had a great time with everyone at lunch. It’s great traveling with friends. We had a fun afternoon in the Animal Kingdom getting to ride Flight of Passage for the first time. Thank god for fast passes, I think the line at that time was over 4 hours! One thing we learned was that the ride isn’t designed for bigger guys. One of our friends was not able to get secured into the ride and had to disembark. It was a big disappointment but Disney tried to make it up to us and gave our whole group a magic fast pass to be used anywhere in the next 48 hours. The ride was probably my new favorite ride at Disney. 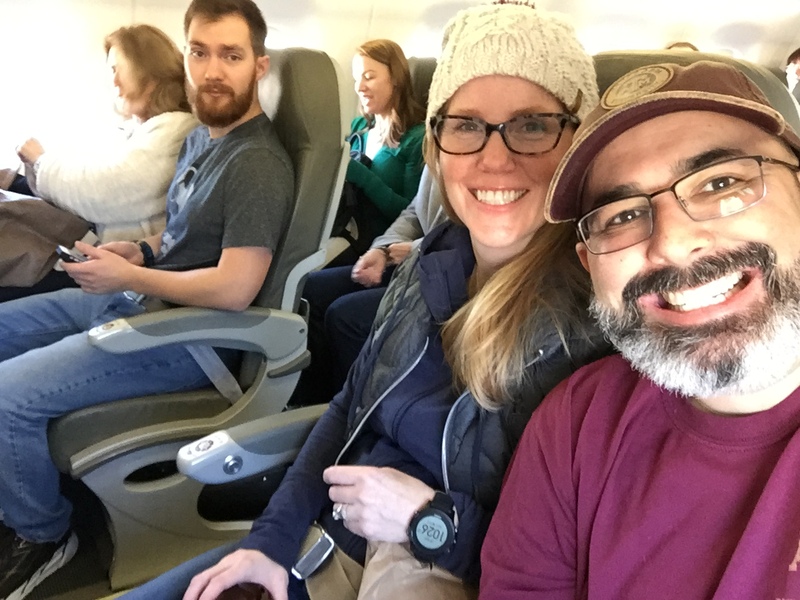 I was whooping and cheering the whole way – you really felt like you were flying! Much different that what I was expecting. We rode a few more AK rides and headed to Epcot for dinner at Chefs De France. 34,623 steps, 10k, parks and ready for sleep! Tomorrows wake up call was 2:30 as our bus time for the half and full is 3:30. Man that sounded early when my head hit the pillow. Credit to RunDisney FB Page. I have to admit – we were a little more tired up at 230 than 3 but we did get to bed just a little earlier too. I was feeling it – everywhere. We ate a little more breakfast – vitamins in us – heaters everywhere – and headed to the corrals. We decided to skip the tent and get to our corral a little earlier to get a buffer between us and the balloon ladies. We were in a good position right behind the 3 hour pace group. Not that we were running for time but that is about our pace so it was a good spot for us. The weather was little better in the low 30’s but still cold enough that we felt it. Many people shed their clothes along the race – so far we have kept everything we started with because it was so chilly. The walk to the corral was a little over a mile from the main areas. We got a hot chocolate and coffee and headed over there. We met a super nice Aussie in the corral that was an Ironman. We had a great time talking about triathlon, races and of course the cold. Wearing shorts – Taylor felt bad for him and gave him his mylar blanket. His goal was to get done before the kid’s races. Our goal was to keep a good pace – save our legs as much as we could for the full and have a great time. I have to say this was probably my favorite race of the four. We ran steady 30/30 intervals until about mile 7/8 when we decided we were far enough ahead we could slow down a little and take a break on our legs. Taylor (not taking Immodium along with me in the morning) needed a potty break and as he got out the balloon ladies ran right past us. We both looked at each other realizing we lost our head start and started running. We caught up to them and said hi – they were very nice and told us – yes they are real and we were off. We were able to put some distance between us and them and were so glad that we trained all year. Given this was our third race – if we hadn’t trained so much – catching up and passing the ladies might have been more of a challenge. Some of the on ramps after we made it past them were a bit of a challenge but overall I think we were doing great. When Kam saw us near the finish line he jumped in with us finishing along side of us. What a great race. I felt such a confidence boost being able to easily come from behind and surpass the balloon ladies. Laughing and excited for our finish we knew we have one more to go. After the race we quickly showered up and rushed to meet everyone for lunch at Tokyo Dining, Epcot. We figured we were so close to lunch might as well eat – and then nap. After our nap we met everyone in the Magic Kingdom for Dinner at Jungle Navigation. Tomorrow was a big day and I was feeling race jitters even at dinner. As it was the last night for some in our group they all stayed for the evening shows and late MK fun. Taylor and I headed back after dinner to get a good sleep before the big day – our first Full Marathon. 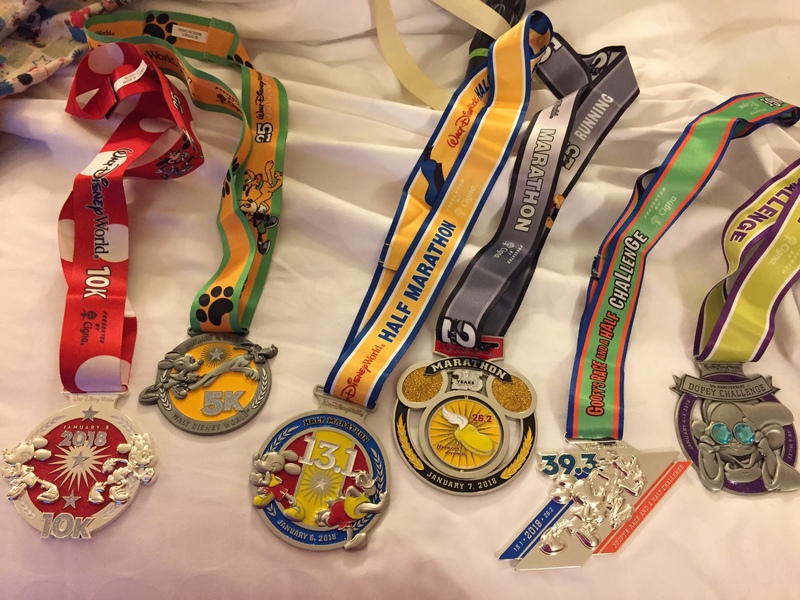 – Half Marathon, Magic Kingdom 52,036 Steps. Taylor and I had reviewed our plan and discussed it prior to the morning. We had the pacing charts for the race and knew we wanted to be with the 630 pacers at the start. We were ready for 15/30 pacing and I had registered for alerts for the Corral H 7:00 pacer so I’d know where they were along the course. I was bringing a little pain medicine with me in case things went really south during the race. Taylor’s feet were really hurting as he had brought the wrong shoes to walk around the parks in. They were swollen and not feeling great. We were both exhausted and when we got to the front of our corral we were both relieved and sat down for the wait. I literally dozed off sitting up waiting for the race to start. I was definitely feeling it but to be fair – four days, parks and three races – I’m sure most people were feeling it by this morning. I had my doubts at that start line but I had made it that far so I was determined to do my best and hopefully finish – even if I was last. We were in the corrals so long it didn’t take long before we needed a pit stop. You wait so long prior to race start and when you are towards the front of your corral it makes it almost impossible to get back to that point after finding a porta potty. Being that we were so tired anyhow – we just figured we’d make a pit stop after getting going. We were with the 630 pacers when we stopped for a quick tinkle and as we came out the 7-hour pacers were running past us. I was totally surprised to see them as I hadn’t been there long. We caught back up to them and quickly realized they were going much faster than they were supposed to be. We passed them up and were with the 6:30 pacers again but could still see the 7:00 group not far behind us – definitely not a 30 min gap. Running through the Magic Kingdom is always the best. I was feeling much better at this point and when we were running down Main Street I started to tear up. I couldn’t believe we were doing it! Everyone’s energy was so positive and when we ran through the castle my heart just leapt. We were passing a lot of people sometimes on the shoulders of the road as space was tight. One of the times Taylor turned to me and said Mom – I need to pull over. The look on his face pretty much said it all. He took off his shoe as he said I think I broke my toe. We were close to the 13 mile marker where I knew we would be seeing Kam to shed some clothes (finally it was warming up!) but we had half the race to go. Taylor felt his toes and realized his toe had become dislocated. As he relayed this news to me – I said – can you pop it back in. He didn’t look pleased but gave it a go. With a wince – his toe as back in place and he was lacing up his shoe again. We saw Kam told him what happened and gave him all our extra layers. It was going to be a high of 67 today! Finally the Florida weather we were hoping for. He was happy to see us – took our photo and we were off again. We stopped at the next medical and got Taylor some Tylenol. He was doing ok – I could tell he was uncomfortable but we were still running. Once we were close to ESPN it was really taking its toll. I shared some of my pain medicine and told him I’m good to get on the next sweeper bus. I can see you are in a lot of pain and I’m ok to call it a good try and quit. That kid was like – I didn’t come this far to quit and you could see the determination on his face. I have to say I hear some serious swearing from time to time but he gutted it out. The kids got grit. We hadn’t seen the balloon ladies at all even though we were somewhere between the 630 pacers and 700 pacers – we knew they were ahead of pace and we were still doing well. I executed my medication as planned and was overall feeling good. Once we passed the last sweep point just at the Boardwalk Taylor told me we would be walking the remainder of the race. I was totally good with that – the kid had really persevered and we were doing fine. The balloon ladies passed us in Epcot during the final part of the race. We were already past the cut off point so we waved to them and kept moving. Once we saw the finish line – both of us were feeling excited and relieved. Kam was in the stands videoing us as we were coming across the finish line. I was so proud of both of us. The hours and hours of training, the aches pains and injuries, illnesses and complications along the way and we met our goal. Our time wasn’t great but we finished standing and not terrible. After leaving medical getting some ice and finally getting our medals we headed to the buses. Taylor informed me that he would not be running for a while and wouldn’t do any races for at least a year. I said what are you talking about – we are going to do this all again next January! Fat chance he said – and we hobbled back to the hotel. Kam brought us pizza beer and wine and we ate and passed out. I knew if I stayed in bed all day I would be worse for it. With lupus and fibromyalgia – moving sometimes is your best medicine. I got everyone up and said let’s go to the parks. I want a picture. Taylor looked at me like I was the Devil but got himself up and moving and the three of us headed to the Magic Kingdom. 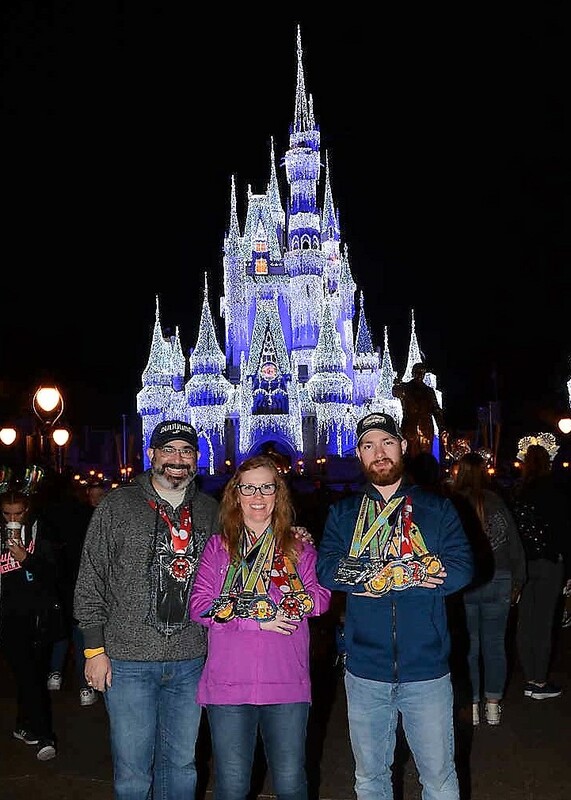 The more I walked the better I felt – We rode rides, got our picture taken with our medals in front of the castle and had a great final night there. I love the Magic Kingdom – it’s my favorite of all the parks and the night just felt magical. We had accomplished our goals and were still on our feet. Dinner at the California Grill was great – sushi for the win. We took a cab back to the hotel and then really crashed. The next morning we got up and were surprised to be sore – but not dying. I was so sad to be heading home but honestly still on a high from what we just had done. Taylor looks at me and says – I think we should go for a run when we get home – I guess he’s come around! I would love to come back and do it all again – although – in a perfect scenario – we’d stay out the week and really enjoy the parks! 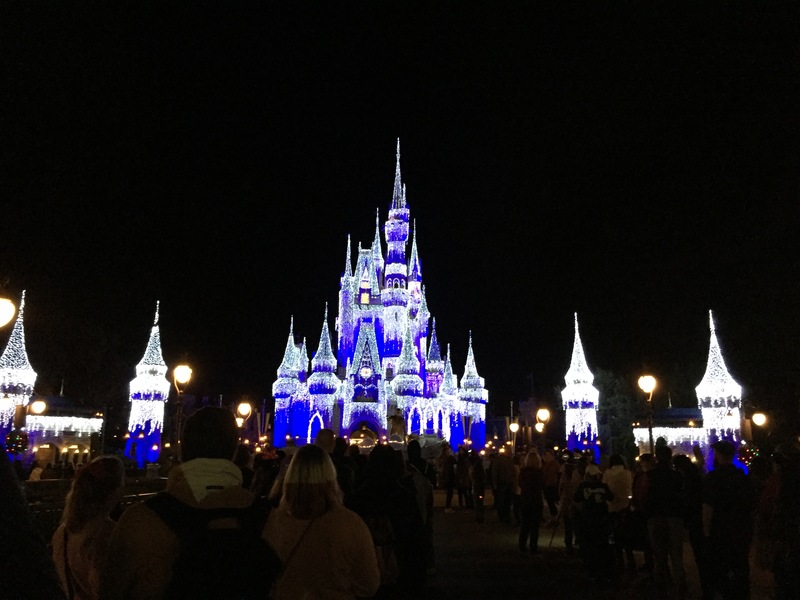 Marathon Day – Full and Magic Kingdom – 76,141 Steps! Some notable stats from the weekend. It was the 25th Annual Event, 5th Annual Dopey Challenge with 7,500 participants, The Goofy Challenge also had 7,500 participants, the 5k and 10k each had 12,500 participants. 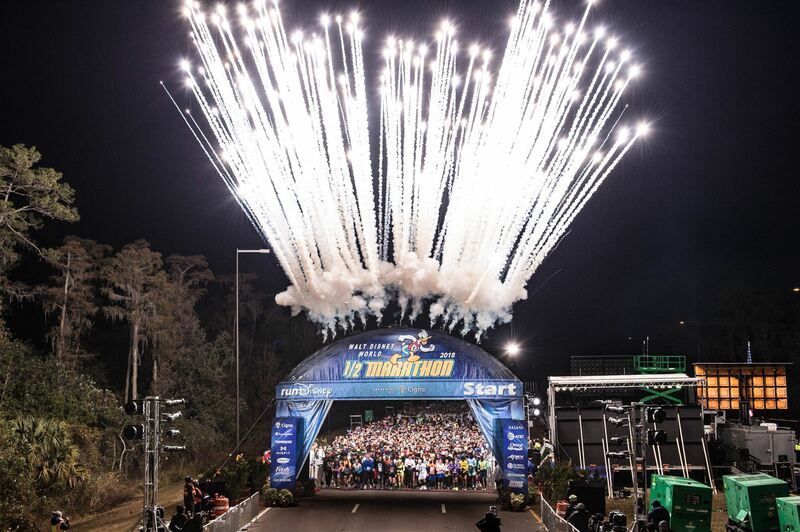 runDisney Kids races and Mickey mile had 5,250 participants. The Half Marathon & Marathon races had 26,000 participants each, approximately 5,900 weekend volunteers and 1,000 medical volunteers. It was tough but a great experience. Thanks to our friends for keeping Kam company when we were sleeping off our races. <3 Can’t wait for our next Disney Race Weekend!